Have you ever seen the impressively large conglomerate rock at Hillsdale College? It has none of the grandeur of a phoenix, but like the phoenix, it symbolizes a powerful rebirth of the college from the ashes of destruction. Michigan Central College, established by Free-Will Baptists in Spring Arbor, eventually assembled a rather impressive faculty. Its facilities, on the other hand, left much to be desired. The Trustees of the college decided to close its doors on July 6, 1853 and move to another location. Ransom Dunn was the most vocal among the faculty of Michigan Central College in favor of this decision, and he held strong views about the ethical framework he wanted for the new college. Possibly influenced by the publication of Uncle Tom's Cabin the year before, Dunn held an unwavering belief that the new college should welcome all religions and races as well as women to its student body. As for the city fathers in Hillsdale, they really wanted the college in their city! They formed a committee and outbid a generous construction offer of $10,000 from the city fathers of Coldwater, and Professor Dunn and his colleagues committed to Hillsdale. 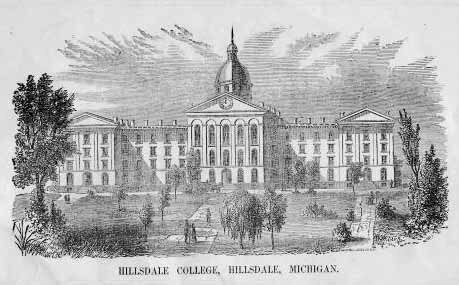 The original Hillsdale College was comprised of three sections, connected into one grand building. The west wing housed the male students' rooms on the third and fourth floors, while the other two floors contained classrooms and laboratories. The centerpiece of the west wing was Professor Rideout's Commercial and Telegraphic Departments, with 18 telegraphic instruments in use. In contrast to what must have been rather loud background noise in the west wing, the east wing had a more gentle presence. There, the female students had their rooms, two Ladies' Societies and the music rooms. The central portion of the college was clearly the seat of power. The lower floors contained offices of the college president, secretary and treasurer, as well as rooms for the professors. On the top floor was the chapel, complete with an organ. Rising majestically over the central building of the college was a domed cupola, visible to people in the city of Hillsdale just as the dome of Central Hall is evident today. Many of the Hillsdale city fathers, including Henry and William Waldron, J.P. Cook, Charles Mitchell and George Underwood, had homes on Manning Street and enjoyed the best view of the college. On March 6, 1874, many of the college students had already left for home at the conclusion of the winter term. Professor Rideout's department was still staffed by students, and other students planned to remain through the break. At 1:00 a.m. two of the male students, sleeping in their rooms in the west wing, were awakened by intense heat and saw flames when they arose. They alerted the others in the building, then ran to the college bell and rang it frantically to alert the city of their plight. Despite a brief rainfall and wind from the east, the fire quickly spread. Townspeople beat the firemen to the college. Some of them climbed to the roof of the central portion, hoping to attack the fire at its source. Among others, Eli Reynolds, Austin Mitchell and Clarence Terwilliger (who soon became famous as the captain of the "Four Oarsmen") were trapped by fire and smoke on the roof. Using an ax, they chopped into the wall of the east wing just in time to escape. The flames had almost reached the cupola by the time the firemen arrived. Once there, they scurried to prepare their two hand-operated pumpers as hoses were laid to the reservoirs. The reservoirs were the only water source available... and they were located too near the burning building. One could not be accessed, and the other was quickly drained. The fire had the upper hand. An hour after the firemen arrived, the bell used to summon them had melted. The fire had raced along the heavy wooden cornice connecting the west wing and central portion and fully engulfed the entire central portion, including the magnificent dome. Heroic efforts were made by firemen, college boys, professors and men and boys from the town to stop the fire. But two hours after it began, two-thirds of the college was destroyed. Only the east wing remained. By luck, there was a fire wall of bricks in place between the central portion and the east wing. A gravel roof gave additional protection. The only point of entry for the fire into the east wing was through a door in the basement. In a daring move, Hugh Cook organized a brick-laying effort with Dr. J.L. Mills and G.M. Troy, professors at the college. While volunteers brought bricks from the walls that had already collapsed, the men blocked the vulnerable east wing basement door. Brave souls continued to rush into the burning buildings to remove furniture and other materials. Coeds valiantly faced the danger, while gawkers, mainly men, smoked their cigars and meerschaums, as though at an entertainment. The Hillsdale Standard reported that "Sheriff Lamb did a good service in removing some of them from their comfortable positions." Unlike most western colleges of its day, which ceased to exist after a disaster of this magnitude, Hillsdale College, like a phoenix, rose again. In its second incarnation the buildings were spaced apart from each other, a nod to the wisdom conferred on the administration after losing almost everything when their eggs were all in one basket - or in a row, in this case. Dr. Arlan Gilbert writes in Historic Hillsdale College that the commitment of the faculty and students to rebuild was never shaken. "Reports about the college fire, telegraphed across the nation, confirmed that operations would not be interrupted. Activities were transferred to East Hall, the College Baptist Church, the professors' homes and rented rooms." And this is where we return to that massive rock. Dated 1874, it sits in the open quadrangle formed by the modern Central Hall and its attendant buildings, Lane, Kendall, Delp and Moss Halls. The senior men of that disastrous year wanted tangible evidence of their faith in Hillsdale College after the fire. Using sixteen horses to pull a sled they constructed, that conglomerate rock weighing fourteen tons was wrestled from Wheatland Township to the college. It was the ultimate demonstration that Hillsdale College may have burned down, but it was never counted out by the professors, the students and their many supporters.